Jewelry Days.com Official Blog: Planet is a Diamond World. Planet is a Diamond World. At least a third of the planet's mass is likely pure diamond. Illustration of the interior of 55 Cancri e — an extremely hot planet with a surface of mostly graphite surrounding a thick layer of diamond, below which is a layer of silicon-based minerals and a molten iron core at the center. The alien planet, a so-called "super-Earth," is called 55 Cancri e and was discovered in 2004 around a nearby star in our Milky Way galaxy. 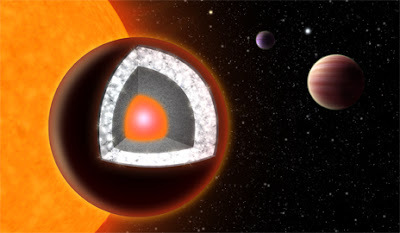 After estimating the planet's mass and radius, and studying its host star's composition, scientists now say the rocky world is composed mainly of carbon (in the form of diamond and graphite), as well as iron, silicon carbide, and potentially silicates.